• I want to thank everyone who has stood with JNU. • I want to thank the people sitting in Parliament deciding what is right and what is wrong. • I want thank their police and some media channels. • I have no hatred towards anybody, especially towards ABVP. • Because the ABVP we have on campus is more rational than the ABVP outside. • There will be no witch hunt against them. • We have no ill feelings towards ABVP because we truly believe in democracy and the Constitution. • We don't look at ABVP as the enemy, we look at them like the Opposition. • They had all of it planned but we were spontaneous. • We stand up for all parts of Constitution - socialism, secularism and equality. • I don't want to comment on the case. It is sub judice. • I have many differences with the PM but I agree with his tweet - Satyameva Jayate - truth will triumph. • In railway stations you will find a guy who shows you magic tricks. We have some people like that in our country. • They say black money will come back, sabka saath sabka vikas, equality and all that. • Yes we Indians forget things too soon but this time the tamasha is too big. These jumlas wont be forgotten. • But what will happen if you speak up? • Their cyber-cell will release doctored videos and count condoms in your dustbins. • This is a planned attack to delegitimise the UGC protests, to prevent justice to Rohith Vemula. • But let me just say it is not easy to get admission in JNU neither it is easy to silence those in JNU. • You cannot dilute our struggle. • They say soldiers are dying on the borders - I salute them. • I want to ask the BJP lawmaker who said in Parliament that soldiers are dying on the border - is he your son or brother? • He is the son or father of the farmer who is dying of drought. • Do not create a false debate in this country. • Who is responsible for their deaths? • We will not rest till everybody has an equal right to prosperity. • We are not asking for freedom from India because India has not colonised anyone. • The man fighting on the border, perhaps he wanted to study but he couldn't get to JNU. 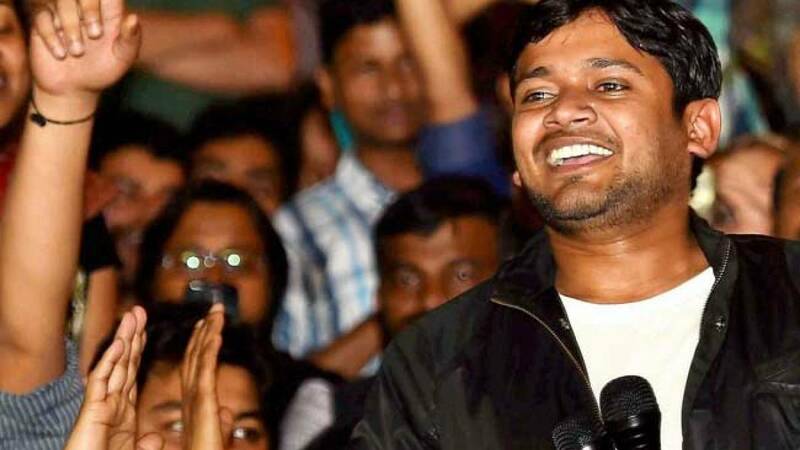 • You want to silence one Rohith, today look how big that revolution has become. • I realised one thing in jail. We people of JNU speak in civilised voices, but we use heavy terminologies. • Perhaps it doesn't reach the common man. We have to establish communication with the common people. • We will bring Sabka Saath Sabka Vikaas for real. • Today the honourable PM was talking about Stalin, I say Modi ji speak about Hitler too sometimes. Or maybe Mussolini? • He speaks of Mann Ki Baat but doesn't listen. • What is happening today in the country is very dangerous. • It is not about one party, one news channel. • I have never told this to anybody but my family makes Rs. 3,000. Can you imagine somebody like me doing a PhD in any other college? • And they are calling anybody who stands up for this, traitor? • What kind of a self-proclaimed nationalism is this? • I want to remind our government that 69 per cent voted against you. • Just 31 per cent voted for you and some of them were caught up in your jumlas. • And today they are running a distraction campaign so that people don't ask them the real questions. • RSS mouthpiece The Organiser did a cover story on JNU. • If they can reason in a debate why JNU should be shut for four months, I will agree with them. • They want to suppress the voice of dissent but I want to tell them, you will never be able to do that. • Once again let's raise slogans for freedom - not from India, but within India. • Freedom from hunger, poverty, the caste system - all of that.